Welcome to the 46th episode in our podcast series that’s about investing in tax-delinquent real estate specifically, but we also cover other REI strategies as well. In our business, we focus on properties where the owners have not paid the property taxes. As a husband and wife investing team, we’ve done nearly 3,800 deals – in land and houses – with little competition and big profits. And we’re letting you in on how to do it all. Intro: Are you ready to transform your financial future? Here’s your chance to see inside the mindset of self-made millionaires, Jack and Michelle Bosch as they pull back the curtain on secrets that can make you rich. Discover how everyday people are breaking the norms and building empires from the ground up using a little low yet proven and time-tested wealth building real estate strategies. 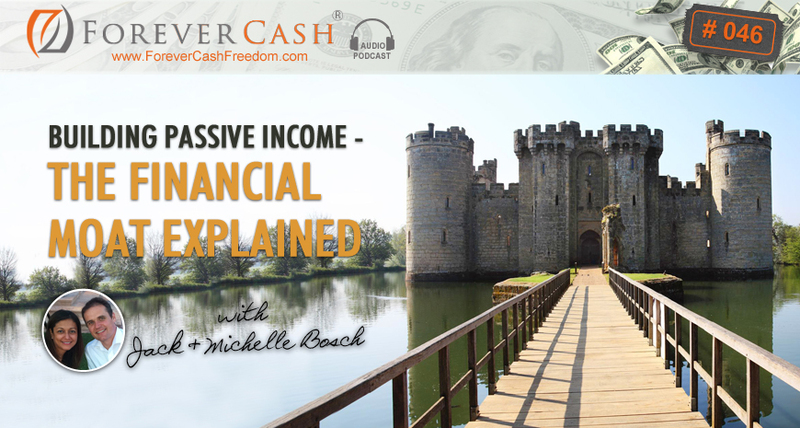 It’s my pleasure to welcome you to the ForeverCash.com podcast and introduce you to our hosts, serial entrepreneurs, investors, educators and best-selling authors, Jack and Michelle Bosch. Strap yourself in for the ride of your life. Jack: And, welcome to the Forever Cash Real Estate and Passive Income Podcast. I added Passive Income today because that’s what we’re going to talk about, right? Michelle: I was like what is going on, did out podcast just changed? I mean, in essence it would be the same but we usually talk about tax linked with real estate when we describe our podcast, but I like the passive income because at the end, this is the ultimate strategy that we’re going after, which is passive income. Jack: Exactly. So, if you have listened to some of our previous podcasts we specialize usually in tax linked with real estate and being in the real estate for the owners who have not paid their property taxes and within that we do have a big emphasis on land and we’ve also flipped a bunch of houses but the key concept behind everything we’ve really done and what we continue to do is that we always have an eye on what we call ‘Forever Cash’. And ‘Forever Cash’, I mean, we had a podcast about that earlier already and ‘Forever Cash’ is really what, it’s like passive income is another word for it so that’s why the ‘Forever Cash Real Estate and Passive Income Podcast’ because it’s covers both on that, on that end, the word ‘Forever Cash’ stands for passive income for that matter. But today I want to talk about a concept that I actually learned… Well, it’s, it’s a very, very, very related to the ‘Forever Cash’ concept, so almost the same but there’s a tweak to that that really got me. Michelle: There’s an addition, I would say. Jack: There’s an addition to it, that, exactly, that, that got me really kind of engaged the other day when I remember that and that’s a piece that I actually learned that I remember the person that told me about that, is the, his name’s… he’s a good friend of ours, his name is Mitch Stephen and Mitch is a real estate investor in Texas I believe in San Antonio Texas and he talks about what we call the ‘Forever Cash’ concept, he calls ‘The Moat’. Now, coming from Germany, I really didn’t know what ‘The Moat’ was initially, but there is moats all over Germany – there’s castles all over Germany, there’s a castles and be out to castles there, well, there’s the moat! And back in the old days the moat was filled with water and there’s still some water, some castles with a water-filled moat out in Germany. Jack: And… I don’t know if there have crocodiles in Germany. Jack: They might have a dragon but… I’m sure there’s a few dragons out there but let’s not get into that subject… And the, the thing is… But the crocodiles probably die in winter. Michelle: Yeah, it’s basically what we talk about as our security plan which is the very first plan of 3: we talk about a security plan, a comfort plan and a luxury plan. So the moat, in our, in my mind. Michelle: Yeah, exactly, can be in all of those, but in my mind, it really represents the security plan. Jack: Correct, I agree, and… But so, what, what is the moat? The moat is… Imagine this: you are having, you’re building up a castle that, your own little house in your castle and you want to protect that, and you want to protect that, so what you do is you build drawbridge on it that you can pull up when, when many predators come. Michelle: You dig the ditch. Jack: And you dig the ditch around it, the moat around it. Michelle: Fill it with water. Michelle: With two cars, maybe one, you know, one trip a year for a vacation with the kids. Jack: Exactly and all of that stuff you have paid for with passive income. Now on top of it, you put all of that into LLC’s you have some legal protection you have some tax benefit protection and so on in there. Jack: Maybe some insurance and all… that’s all the different alligators and that’s the moat in the around you that, that’s the water and the thing, the protection that you have around it. So if you have all these things in place you literally could pull the drawbridge up and basically live in that world, live in your little castle, in your little kingdom that again might be just a little, little house on a little lot, in a little subdivision but it’s all, it’s paid for or at least your expenses are harmless and paid for by passive income for the rest of your life. Jack: Forever is not… if that’s the case and that’s where the parallel comes, that’s what we call ‘Forever Cash’. Now ‘Forever Cash’ is just an expression for passive income. Once you reach the ‘Forever Cash’, reach that limit that you have all your expenses taken care of, you essentially have created the castle and you have essentially built with the… sort of protections of things around that you have essentially built your kingdom with the moat around it and that’s the concept of the moat when the passive income exceeds your active expenses you are financially free and when you have done that in a way that it last for a long time then you have the moat. Michelle: You have the moat. Jack: You have the moat, you have the castle, you have the drawbridge you pull it up and you put up your feet and you basically are safe inside that moat, inside of that castle. Michelle: Now, for us, once we have that castle, which is our security plan or our moat, you know, we move on to our comfort plan. But Mitch has a wonderful way to illustrate how to make the transition and move and start working towards your comfort and your luxury plan. And this is I think where it’s like, it’s, it’s beautiful. Jack: What you mean we have a little ‘A-ha moment’ on it, so..
Michelle: Yeah, absolutely and so, I’ll have Jack describe it because he’s such a great storyteller, so… Keep going. Jack: So, so now back to the expansion of the moat. So here’s a thing, now imagine you in that situation, you’re in your little castle, it covers all the basic expenses nothing fancy yet, you, you built, you built your financial security, you protected against predators and the drawbridge is up and you are just, you quit your job, and, and you’re basically in retirement. That’s basically what it is. So, you’re sitting now in this retirement with being financially taken care for the rest of your life, you now have two choices: you now can stay like that forever and if that’s the goal then wonderful; or you might want to expand that moat make… build a bigger castle, bring in some, some rich, some additional riches and basically continue building on your financial wealth and perhaps over time be able to move on to a bigger castle with a bigger moat but also still all covered. And that’s what we sometimes called the, the comfort plan in that case. Michelle: And when you do that, though, and you have the security plan in place or the initial moat, you know, that you’ve created, what you have is, when you start building the comfort plan, what you have is a piece of mind that unless you experience, you know, nobody will be able to describe it, unless you’re there basically. Jack: And nobody can take that from you either. Jack: And conquer new worlds! Exactly! That’s very, very funny how he says it with this, kind of like special accent that he has there and he’s very, very cute. Michelle: And… never mind, sorry. Jack: Full armor and go expand your kingdom and go in, haul in some riches. Now, here is one of two things that can happen now: everything can go as planned and you come back and you are the hero and everything is wonderful or you identify that actually the world is different than you thought, that you weren’t all prepared, that there’s hurdles coming up, that the enemy’s somewhere else, you get ambushed, all of a sudden always you lose money, you start… you, you re… you have to retreat, you have to run back to your castle and you get arrows in your back and you made it… make it back to your castle, you pull up the drawbridge back and you are safe again. Now, if that happens, that was really kind of like a little ‘A-ha moment’ for me is like when I went read that, the key is… one key that we fully agree with is that we also, that we also talk about it a lot is that you can’t retreat back into your moat, into your castle because once you have your castle and your moat, you will never touch that asset ever again, you will never jeopardize that asset again. Jack: Exactly, you never go and risk what you’ve already build that has, that is already proven to provide financial freedom for the rest of your life. When you go out, expand… you only expand with either additional funds that you have that you can afford to lose or you go expand with greater methods and so on but you never risk what is, that you already have built. So, therefore what happens if, if you indeed lose the battle and you go out there and you get, have some arrows in your back you can, and that’s very crucial, you can retreat into you’re, back into your castle, live exactly like you did before you went out to go on expansion mode. Jack: …You heal, you learn about what happened why, what, why did I lose that battle what did I do wrong, go do some more studying and then put the drawbridge back down with a new plan and go out there and, and, and, and battle the world, conquer new worlds again with a better plan, a better strategy and more experience under your belt and some scars to show for it too, which is absolutely normal and then chances are you going to win and then when you win now you come home as, as, as being the hero. So if you’ve always had that plan of creating that huge company or something like that, if you’ve always had, always had that plan of creating something world changing then if you have that moat in place, it’s a wonderful place to get started from because if you don’t accomplish your goal you’ll always have your castle and your moat to come back to and that’s kind of like the little paradigm shift that it had for us because we are in the process right now of creating some new pieces and some new things and every time you create some new pieces in them, new things, there’s always a little anxiety that comes with it, right? Jack: There’s always a little fear, there’s always a little bit… there’s milestones and that there’s also hurdles and things that come in your, in, in your way and roadblocks that come in your way and, and as you go over them and as you figure them of them is just a wonderful thing to know that you can always if… Push comes to shove; you can always retreat and be safe inside your castle surrounded by your moat. Michelle: And things don’t go as planned. Jack: And be bold and go for that home run itself just for singles because with the singles is how you build your moat in the first place, right, with the singles and doubles – that’s how you created it: one land deal by… at the time, once land deal after the other, 5000 here 10,000 there 50,000, there another 5000 there, that’s how you paid off your debt, that’s our house deal whichever it is. Michelle: And it’s very, if you think about it it’s very defensive, you’re playing a game of not, not, not to lose. Jack: But if you’re now, if you have your moat in place you know that you can go out there and give it your all and put all your energy into that and if it fails, well, you know what? We would rather shoot for the stars and land on the moon then just shooting for, I don’t know, the backyard and hitting the wall, right? I don’t know if that’s a good analogy here, but it… you get the point… But you can do that now because you have freedom to do that because you got your financials already taken care of so without understanding we are now going out even more bold than we ever have because we got a strong moat already built and we got those pieces already in place and at the same time we… as we succeed in those areas obviously a certain percentage of that will be put back into the moat to expand that moat. Jack: And to grow the castle and grow those things even more but if they don’t work out it’s not the end of the world, it’s not the end of the world, yes, you’re going to probably shed some tears over some lost money but you still got what you already built to fall back to. Jack: And that’s the beautiful kind of aspect on it. Michelle: Yeah, and, and… When Jack was describing this to me, what I loved about it is that if you think about it, in nature, there’s always this cycle of expansion and contraction. The one cannot exist without the other and what the moat concept or you know, what the moat gives you is basically a safety place to… to contract, when it’s time to contract, when it’s time to heal, when it’s time to rest, when it’s time to, you know, strategize, to think about the, what’s the next big step it, right? Jack: Absolutely, that’s, that’s another beautiful way, beautiful aspect of the moat concept. Great, so that’s really all I wanted to, all we wanted to share right now so it’s going to be a short podcast… Would you like to add something to it. Jack: And level your story or something? Michelle: I, I, I love your storytelling abilities. Maybe that’s why I fell in love with him. Jack: Maybe… that might be probably the only reason why… And, and so, so what are we doing right now, I haven’t even told you, well, we are working on two concepts, right, we’re working on two things that are really fairly bold and so on and one of them is a mastermind for already successful business people where we basically get up to 25 business owners in one room for four times a year and we really make it a point to get only seven-figure plus and ideally even higher than that, these are good percentage of business owners in the room and, and so that they can help each other. We’ve been creating this as a mastermind within, with an aspect of giving first, where basically everyone comes in and shares first what works in their market, what works in their business really, really well so everyone else can learn from that and then they, they say ‘and I need help with XYZ’ and then everyone else act as the board of directors and helps each other. Now this is a very, very, very powerful concept I belong to a mastermind like that that industry-specific and everyone in that mastermind is literally doubled and tripled their business in the last couple of years. And now we’re taking the concept and expanding it into an industry independent concept right, you got, might have a plumber there will a big plumbing company and somebody else was a IT company and somebody else with an Internet marketing company and somebody else with a CPA firm and they all can help each other because all have the same issues, all have issues around leadership, all are… all need, all the help and all can learn more about leadership of the owner, about the goal, the vision of the company. Jack: The people in the company. Jack: Strategy and somebody who has a call center with a 100 people can contribute a tremendous amount to somebody who just is start…has three people on the phone and doesn’t know how to manage these three people because there’s obviously there, figured something out, the other one hasn’t yet so there’s lots of basically cross pollinating happening in that room and that something we’re starting and that’s obviously that’s, that’s, that’s very, very exciting to us and the other parties on the other side we are having a training platform. Jack: So, it’s www.UltimateBoardroom.com if you’re interested in that honestly feel free to go check it out UltimateBoardroom.com and as a second piece we’re doing is we are, we just launched a website called MyOpenPath.com and is already at its inception the largest real estate training, the largest training platform for real estate online business building and financial independence, we literally took, we’re literally creating a course a week right now that we’re putting out there we’re going… we’re having aligned ourselves with the best of the best in the real estate space, in the Internet marketing space, in the personal-finance, financial freedom space. Michelle: And there are already a thousand hour courses. But we really believe that we can… our goal is to reach 1 million people on those two platforms by the end of 2018 so we have some really big goals and that goes really right along the moat here. We know we’re going to be able to accomplish that but at the same time if something really dramatically were to go wrong which we don’t expect, expect to happen, we can always rely back on the moat that we’ve already created which gives us the liberty to go full out and we spent resources on this, on this, on these two projects and spend energy on these two projects and really pursue, not just that, but we picked those two projects because once your financials are in place you can go 100% where your heart is. We still do our real estate deals and while we continue many of the things we have been doing, so with that, I just wanted to share that with you because that just… that story about the moat just came at the right time when we’re just in the middle of that and it kind of summarized how it is that we can do those things in addition to everything we’ve been doing. Jack: So with that I want to thank you for your attention. Jack: And we’ll talk to you in our next podcast. Jack: And you do that by going to iTunes and basically pulling up your iTunes and then looking for ‘Forever Cash’ if you look for ‘Forever Cash’ a podcast comes right up write us give us a review and the more stars the better. Michelle: Yes, and if you have any questions, please go ahead and ask them and we would to answer some of your questions on our subsequent podcast. Michelle: One last thing that I wanted to mention regarding the Open Path is that the Open Path comes. Michelle: The My Open Path comes not just with the access to this incredibly large library, you know, of education on business building and entrepreneurship and real estate and financial independence but it also comes with an aspect of community. Jack: It comes with a closed Facebook group that only members only, so the members of the subscribers to the my open path get access to that and it literally becomes one on one support from our team on your path to financial independence and obviously the Ultimate Boardroom is the same thing and it’s direct support from us and our team for anyone… We, we’re basically the connectors there between seven-figure businesses that have a need and we are well-connected and we can connect them with whoever they need to as part of the community that we’re building in that part too. Jack: All right, so go check them out, and we’ll talk to you hopefully next week. Outro: Thanks for listening to the Forever Cash Freedom Podcast, subscribe now for future content packed episodes on how to push the ejector seat on your financial hamster wheel and discover a radical way to freedom and wealth through cutting-edge real estate investing strategies, to learn more about living the Forever Cash lifestyle investing smartly and becoming financially free, visit www.ForeverCashFreedom.com to claim your free Forever Cash Starter Kit today!